This article uses insights obtained through Reflection's mobile games market data. You can check out the tool on the Reflection website. Releasing a mobile game into the wild is a big moment for any developer. Given how highly competitive the app stores on iOS and Android have become, breaking into the top download rankings is a big challenge. Particularly for those who don’t have a UA budget or may not have much idea of what it takes to break into the upper echelons beyond “lots of downloads”. Using data from mobile apps market insights firm Reflection, we’ve come up with estimates for the number of downloads you’ll need to break into the upper echelons of the download charts on the iPhone App Store. The data we’ve put together is based on the month of January 2017. This data looks at the daily download averages for free apps in the top 200, top 100, top 50 and top 10 rankings on the App Store. The countries covered in this are the top five from the available data: US, UK, France, Germany and Italy. For the first chart we took a look at the daily downloads average from January 2017 to get into the top 200 in the free overall and games categories. From this data we can see that the US is by far the biggest market, taking an average of 2,929 downloads a day to break into the top 200 rankings for free games. The free overall chart requires substantially more downloads however at 6,720. The UK meanwhile requires much less – 1,389 daily downloads to break the overall top 200 and 621 downloads to break the top 200 games. Here we take a look at the top 100 rankings, where the numbers begin to rise typically by around 65% to 80% of the number of downloads. 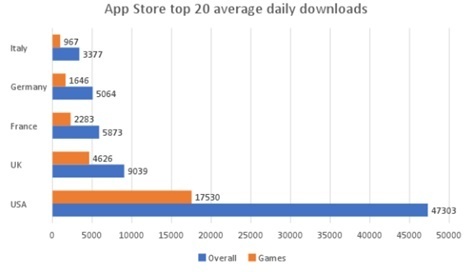 The US App Store now requires an average of 11,662 downloads every day to appear in the overall top downloads charts, while 4,889 downloads a day are required to enter the top 100 games. As for the UK, approximately 2,379 downloads are required a day to break through, or 1,115 to hit the top 100 free games. A similar pattern emerges for the top 50, with the download requirements rising roughly 65% to 80% for each country. By the top 20, the number of downloads starts to increase, typically to over double. 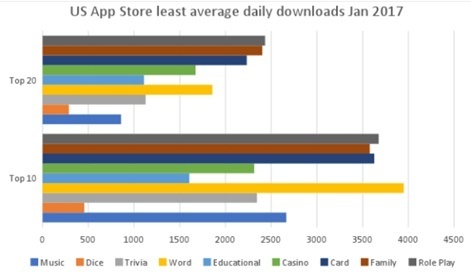 As we get to the top 10, the rise in average daily downloads, while still significant, drops off. Here you can see that free apps in the overall US top 10 rankings generate around 68,133 downloads on average a day. For the free games chart, this stands at 26,534 a day on average. Other countries also require big download numbers to break into the top free games charts: UK (6,309), France (3,479), Germany (2,610), and Italy (1,600). Remember – we’re not talking overall top grossing here, where games dominate, but topping the free downloads charts, where you’ll be competing with apps such as WhatsApp, Instagram, SnapChat and Facebook in the overall rankings. 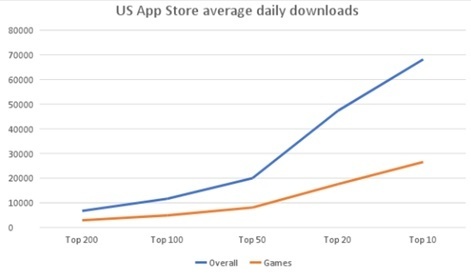 Below we’ve compared the average daily downloads required to break into the top 200, 100, 50, 20 and 10 in the US. The line graph shows a steady and stable increase in the number of average downloads up until the top 50. 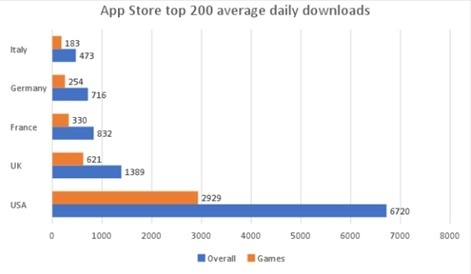 After this, a steeper line forms, showing the difficulty of breaking into the top 50, 20 and 10, where the number of daily downloads ramps up significantly. Competing here is where you’ll almost definitely need to form a clear marketing strategy, if you hadn’t already - assuming your goal is to penetrate the top 50 and stay there for a week, a month, or longer. Next we take a look at the genres with the biggest competition in the US, and the number of average daily downloads it takes to break into the top rankings of those subcategories. 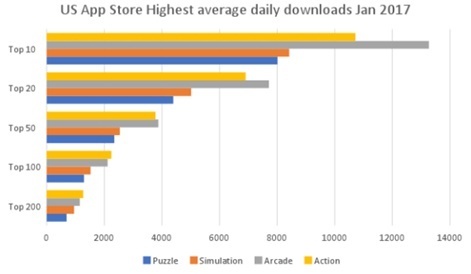 The Action, Arcade, Sim and Puzzle subcategories required the highest number of average daily downloads to break into the top rankings. Interestingly, this chart shows how download requirements in certain subcategories rise exponentially as they approach the top 10. Arcade in particular, which requires less average daily downloads than action up to the top 100, gets much fiercer competition than any other subcategory from the top 50 onwards. Here we take a look at the subcategories with the least average daily downloads from the top 200 to the top 10. It’s interesting to note that, as we approach the top 10, the competition for certain subcategories heats up significantly. 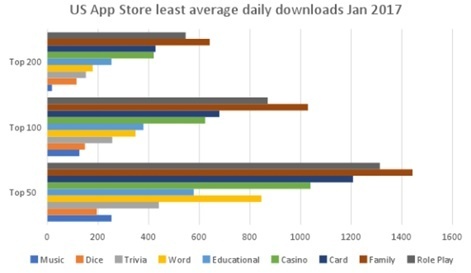 Word games for example require approximately 1,857 daily downloads to break into the top 20 rankings in the subcategory. To breach the top 10 however, you may need roughly 3,949 downloads a day on average. The Dice subcategory has the least competition throughout the rankings, requiring just 115 daily downloads on average to break into the top 200, and around 456 to make it into the top 10. Dice, educational, casino and trivia subcategories all have the lowest requirements for developers looking to break into the top 10 of these genres. Breaking rankings down into subcategories offers an insight into exactly what’s needed to become the big players in these genre markets. While some may seem relatively easier to crack in terms of getting into the top 200 or 100 rankings, some genres can suddenly have much more heated competition when it comes to the top 20 and top 10. This could mean that to stand a chance, a significant investment and UA budget will be required – assuming the goal is to be one of the big players in the target category. Other genres meanwhile, such as Dice and Educational for example, are much more consistent in their download numbers as we look through the charts. You can find much more detail on daily downloads on the App Store using the Reflection Lab tool. You can break down your search by month, country, device and subcategory, with available listings for daily downloads (free), daily downloads (paid), and daily revenues.